I thought that it would be kind of fun to show you around my very first patchwork project that I made waaaaay back in 6th grade Home Economics. Now it isn't even called that, it is called Family and Consumer Sciences (FACS). Here it is in all it's faded glory! My first patchwork pillow. Not bad for my 1st attempt. Color selection was good. Although, I think the fabric is a poly/cotton blend. Not sure that I had too much of a choice back then. So I probably chose what appealed to me. You can even see that I did a pretty decent job of matching points. And then also mixed that in with a not so decent job of matching points. The pillow was stuffed with, I think, a poly fiber fill. Not sure why, but we didn't use a pillow form. Maybe lack of availability or price. The back was just simple plain solid. You can see where I stitched it closed, as we did not do an envelope style back. 1. That I still actually have it! 2. That I did a pretty decent job, at least I think so. 3. It really drove home the memory of learning to sew garments. I so enjoyed doing that in Home Economics and made tons!! 4. 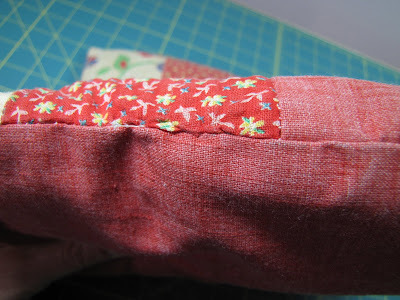 It also gave me a comforting kind of feeling, knowing that I have always enjoyed sewing in all its forms. Do you still have your very first sewing/quilting project? If you do, I would love to see it!! Or at least hear about it and what memories it brings back for you. I have enjoyed sharing mine. Before you leave don't forget to enter my big fabric GIVEAWAY on this post, by clicking here.